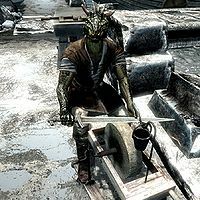 Neetrenaza is an Argonian scout and dock worker who lives in the Argonian Assemblage, outside of Windhelm. He maintains a very bitter attitude about the Nords that he works for. Neetrenaza begins his day at 7:10am by having a quick breakfast for an hour. After that hour is done, he will return to his bed for fifty more minutes. at 9am he will head outside to work on the docks. He will end the workday after ten hours at 7pm. Neetrenaza will then head back inside to return to his bed for a short nap. He will wake up once more at 7:45pm for a two hour long dinner, before heading back to bed to rest for tomorrow. Neetrenaza wears a set of clothes and a pair of boots. He carries an iron dagger to defend himself. Besides that, he carries a key to the Argonian Assemblage and a selection of lower-class items and gold. Approaching Neetrenaza will have him comment on his hatred for the Nords: "The Nords don't appreciate us, but so what? I don't appreciate them right back." He might also mention the dangers of being down on the docks: "The docks can be a dangerous place. Don't expect me to save you if you fall in." If you are not an Argonian, he will suggest that you should leave the Argonian-populated docks: "Look, we don't have much love for your kind down here. Probably best if you just left." Argonians will instead hear a much more cheerful welcome to the docks: "Haven't seen you here before, egg brother/sister. Welcome!" This page was last modified on 29 November 2015, at 17:43.